Ideal for adding extra distance to 10 Gb communications links, this fiber-pigtailed optical receiver combines the very high responsivity of an InGaAs Avalanche Photodiode (APD) with a low-noise amplifier that offers 20 dB gain. With variable gain of M=2 to M=7, performance can be matched to line conditions and sensitivity varied from -17 to -26 dBm (BER 10-12, PRBS: 231-1). Suitable for NRZ applications with or without FEC. The APD Lab Buddy has a programmable bias voltage source and a built-in temperature controller for improved gain stabilization and increased reliability. The bias and temperature can be set either from the front panel or via a remote computer interface. The APD Lab Buddy monitors the bias, temperature, and average DC photocurrent of the APD in real-time. As an additional option, the APD Lab Buddy can now include a CDR to minimize test time by simplifying measurements. The APD + CDR Lab Buddy includes a limiting amplifier with LOS power detector, and PLL data re-timer with a LOL indicator. The Lab Buddy supports multi-rate operation from 9.5 Gb/s thru 11.1 Gb/s. The CDR function has a 7mVp-p Input Sensitivity and 0.6UIp-p total high-frequency jitter tolerance. 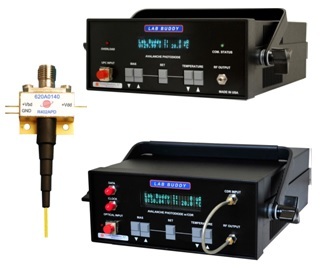 The clock and data outputs are compatible with BER test stations. The CDR is an ideal option for applications such as SONET, Ethernet, PON, and Fiber Channel.